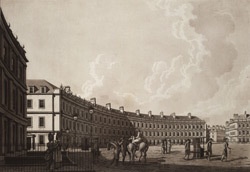 The Circus was part of an ambitious scheme to create a classical-style centre in Bath. A circular open space enclosed by crescents of terraced housing, the circus was built between 1754 and 1758 to a design by John Wood the Younger. It was impressively decorated in the Roman style - each building floor was externally decorated by differentiated orders of columns.